Canberra Quilters members Beth and Trevor Reid, Helen Gray, Carolyn Sullivan and Dianne Firth are part of the Australia Wide 6 Exhibition which runs at The Q from February 11, until 9 March 2019. They will be giving a floor talk about their work on Saturday 2 March 12 noon – 1pm. Dianne will also include an overview of the exhibition. An initiative of The Australian Quilters Association Inc.
Quilters are invited to demonstrate their talents and originality interpreting the theme “Reflection”. 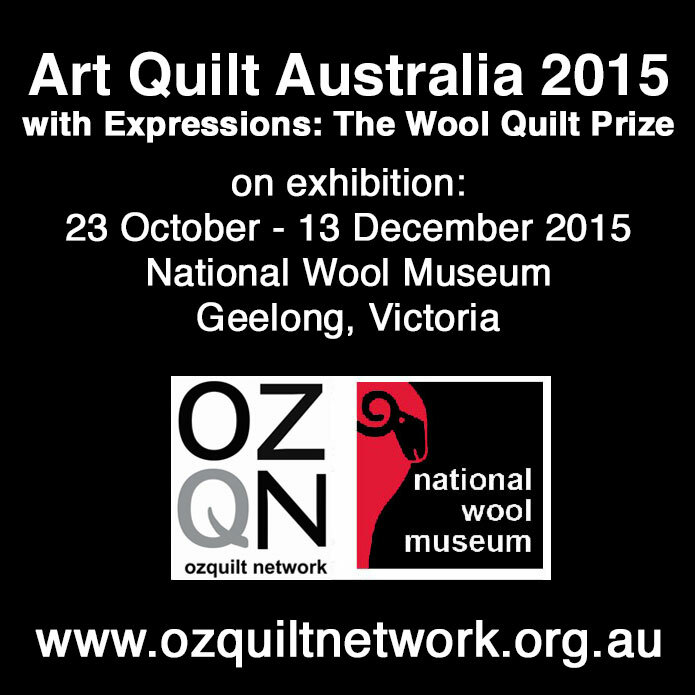 AQIPP is a juried, judged and sponsored exhibition which is open to all quilters in Australia. Whether contemplating reflection in still water or reflecting on life, change, environment or the world around us, reflection helps to instil in us a sense of time and place. Places are still available for anyone interested in quilts, both heritage and contemporary, to attend the 2015 OZQN Conference Gala, Art Quilts: Evolution & Revolution. Two exhibitions, papers by experts and study of historic heritage quilts from the National Wool Museum combine into a unique occasion not to be repeated. Take advantage of this low-cost opportunity to exchange ideas and to be inspired at a one-day forum of networking, exhibition enrichment and papers to educate, enthuse and inform. Optional supporting activities contribute to this rewarding experience open to all quilt makers and textile enthusiasts. Late registration is available at very low cost for just one day or for all activities in this exciting event taking place in Geelong 20-25 October.